Wed, Jul 11, 2018, 12:33 pm SL Time, ColomboPage News Desk, Sri Lanka. July 11, Colombo: Sri Lanka's National Economic Council has paid attention on finding a systematic solution to save the customer from the disadvantageous circumstances emerged due to the business dealers attempting to gain exorbitant profits when providing goods and services. This was discussed broadly at a meeting of the National Economic Council presided over by President Maithripala Sirisena at the President's office on Monday (July 10). The attention was focused on making amendments to the tax policy in order to increase foreign exchange reserves by increasing exports and managing imports. Also discussions focused on providing concessions to the development in exports and to implement a tax policy to encourage exports. The Foreign exchange makes a considerable contribution for the development of the Sri Lankan economy. The President said that foreign exchange remittances to the country should be free of taxes and levies as this would be useful to enhance foreign exchange reserves. President Sirisena who instructed to expedite construction of a 12-inch diameter pipeline to transport oil from the port of Colombo to Kolonnawa refinery, discussed the steps to be taken to solve the issues arisen at Mahawatta area regarding the construction of the pipeline. 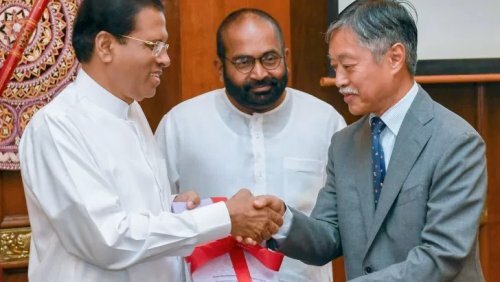 The energy sector development plan for the period up to 2030, which has been planned by the Ministry of Power and Energy and funded by Japan was presented to the President by Japanese Ambassador Kenichi Suganuma. Chief Representative of JICA Sri Lanka office was also present in this event. Ministers Mangala Samaraweera, Mahinda Samarasinghe, Arjuna Ranatunga, Ranjith Siyambalapitiya, Kabir Hashim, State Minister, Ajith. Perera, and other ministers, Secretary to the President Udaya. R. Seneviratne, Secretary-General of the National Economic Council, Prof Lalith Samarakoon and other members were present at the occasion.